Acne, a recurring nightmare for many, pops up unannounced usually at the most inconvenient times, say the night before a date. Covering it with foundation and concealer will do no good. Instead, it will exacerbate the problem. Acne occurs when the hair follicles in your skin get plugged up with dead skin cells and oil produced by the skin's sebaceous glands or infected with bacteria. This condition causes whiteheads, blackheads, and pimples. Acne commonly occurs on the face, shoulders, and back, but you can get it on other areas of your body, too. Fortunately, there’s one handy ingredient that can help treat acne naturally. 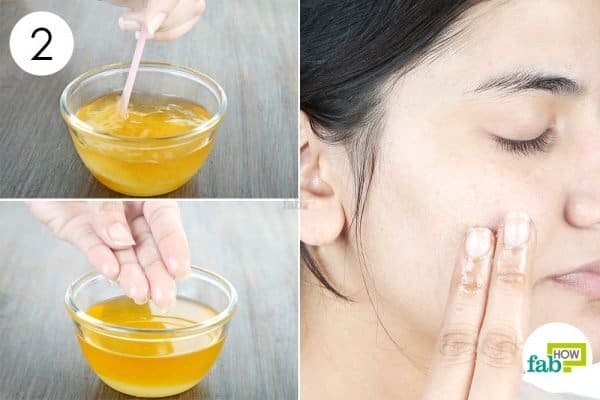 Honey, which has been used for thousands of years to heal wounds, is also considered one of the best home remedies for skin troubles like acne. Honey possesses antiseptic, antibacterial and anti-inflammatory properties. It not only removes the Propionibacterium acnes (P. acnes) (acne-causing bacteria) from your pores but also reduces inflammation and redness due to breakouts. Plus, being a natural humectant, it hydrates your skin without making it oily. 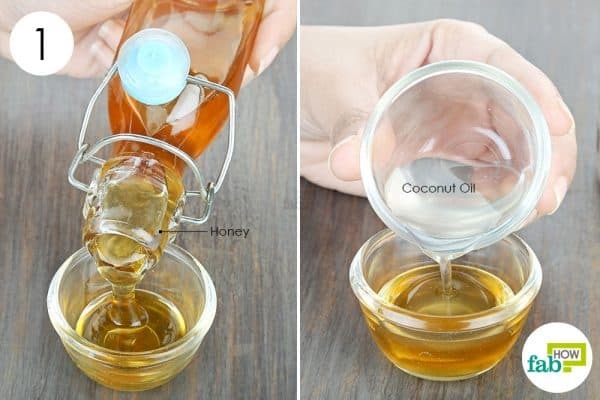 Read on to learn ten different ways in which you can use honey for acne without slathering harmful chemicals on your skin. Is your acne not responding to typical commercial treatments involving harsh cleansers and creams? 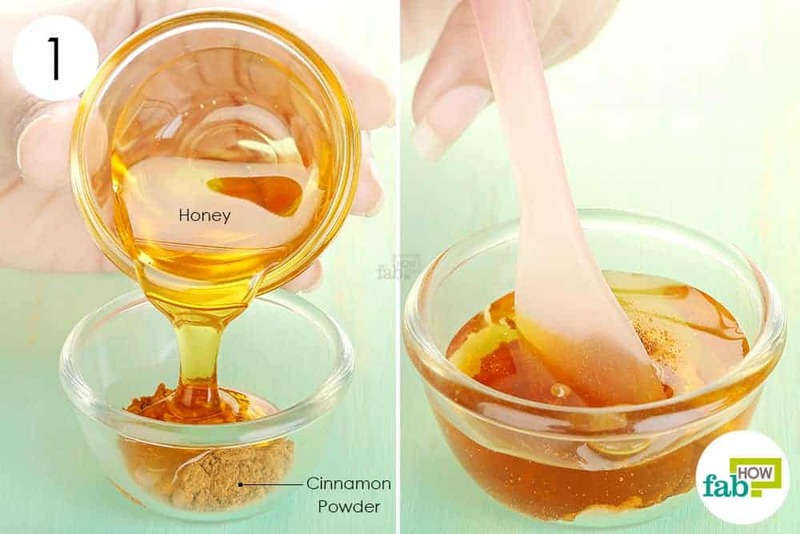 You can just head to your kitchen and find two powerful ingredients – cinnamon and honey – to treat the acne. The antimicrobial properties of cinnamon inhibit the growth of bacteria that causes acne. Plus, it reduces the inflammation due to breakouts. 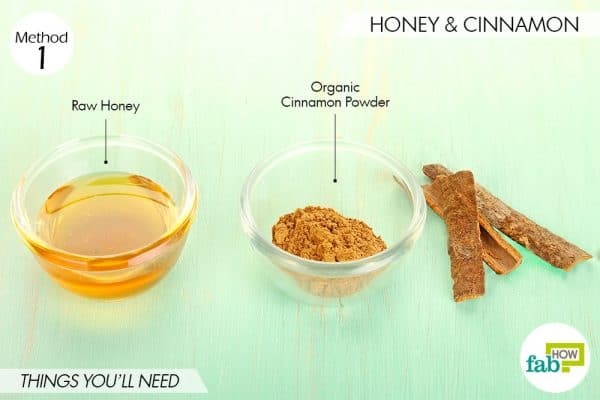 Using cinnamon with honey also provides nourishment and moisture to your skin. Caution: Do a patch test with the paste on your arm to check if you’re allergic to or have an adverse reaction to the cinnamon before applying it on your acne. Put 1 tablespoon of raw honey in a bowl. 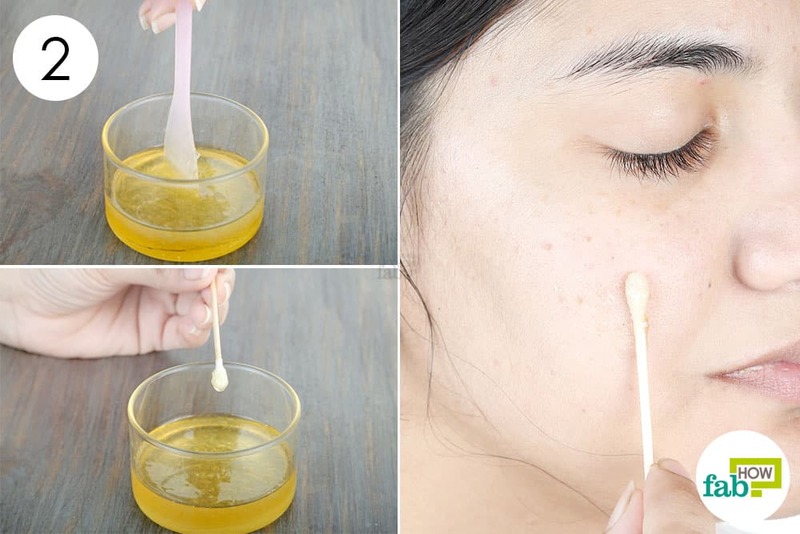 Use a cotton swab to apply the mixture as a spot treatment for acne. Wash it off with warm water and pat dry your skin. Repeat 2 or 3 times a week for 2 weeks to treat the acne. Honey is a natural humectant. It rehydrates your skin and prevents loss of moisture by binding the moisture particles to your skin. Additionally, it repairs acne-damaged skin and helps fade acne scars. Baking soda acts as a mild exfoliant, opening up and unclogging the blocked pores by removing all the dead skin cells and impurities. Thoroughly blend the ingredients using a spatula. Let it sit for 15 to 20 minutes, then wash it off with lukewarm water. Gently pat dry your skin using a soft towel and apply an oil-free moisturizer. 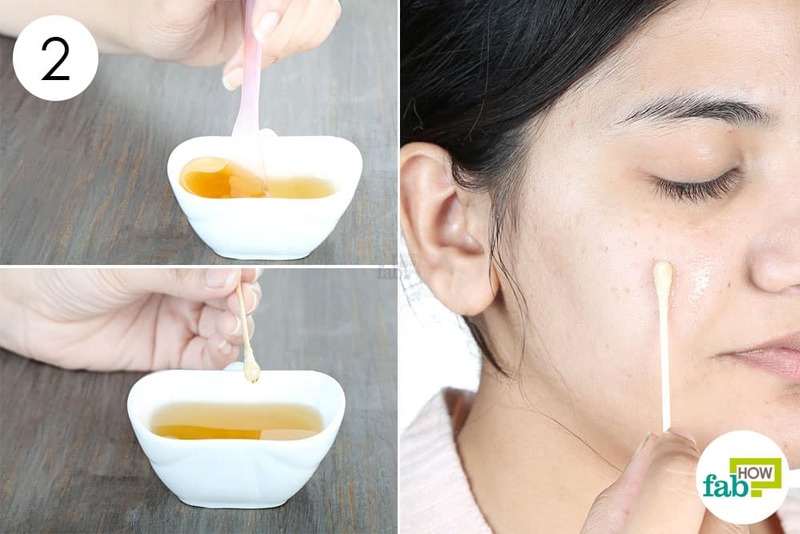 Use this remedy every other day to get acne-free skin in 2 weeks. 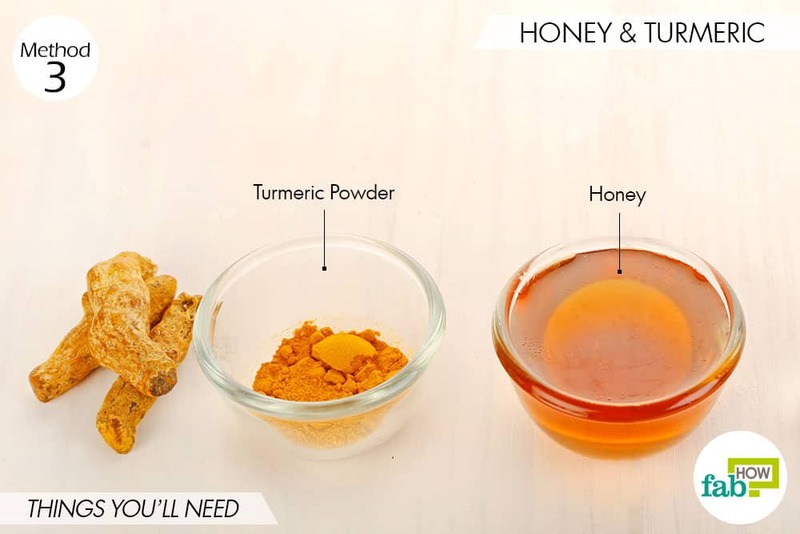 You can also make a highly effective DIY face mask to use honey for acne and pimples just by mixing honey and turmeric. 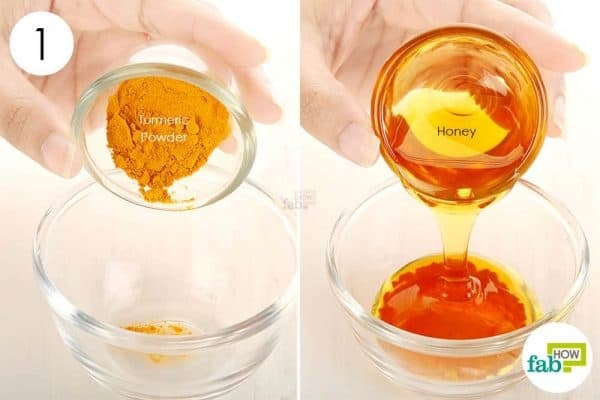 Since honey moisturizes the skin and turmeric inhibits the growth of acne-causing bacteria, this mask serves as an effective treatment for people who have a combination skin type. Caution: Turmeric’s active component curcumin may irritate your skin. Do a patch test with the paste on your arm before using it on your acne. Add 2 tablespoons of honey to it. Stir the ingredients thoroughly to form a smooth paste. Apply the paste on the acne-affected areas. 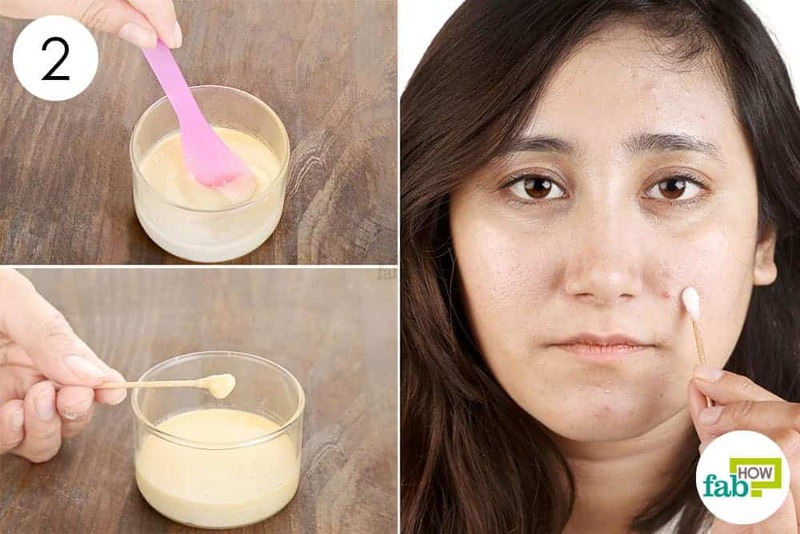 Use this mask 2 or 3 times a week to get a soft and acne-free skin. This is an age-old remedy that not only soothes your skin but also hydrates it. 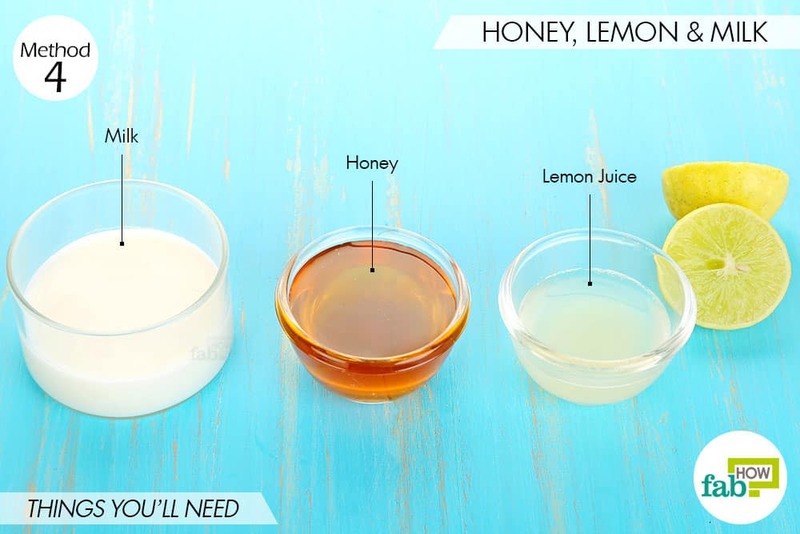 Using a mixture of honey, lemon and milk can treat acne in any skin type. 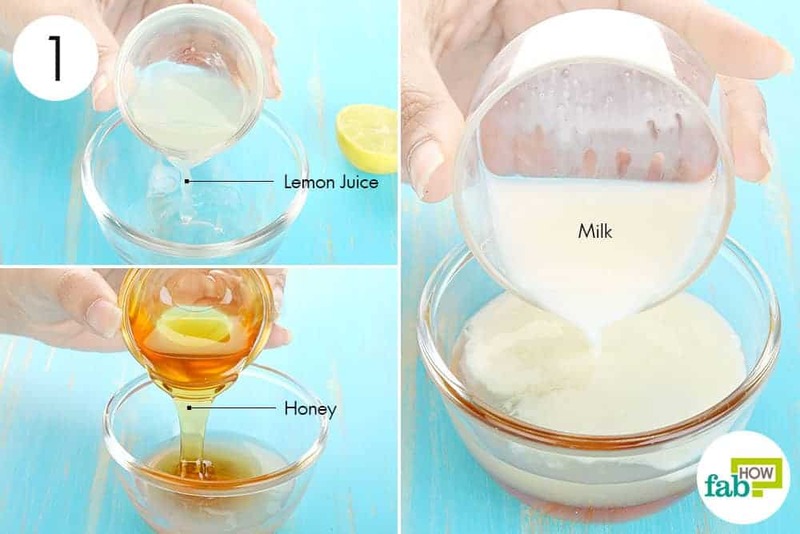 The antibacterial property of honey and lemon removes bacteria from the pores, while the milk cleanses your skin. By releasing hydrogen peroxide, honey cuts through the excess oil in clogged pores to dehydrate the bacteria and kill it effectively. It also helps deeply hydrate the skin and prevent excess oil secretion, which may cause or worsen breakouts. Caution: Do a patch test on your arm before applying this solution on your acne. The lemon juice may irritate your skin. Put 2 tablespoons of honey in a bowl. Also, add ¼ cup of milk to make a smooth solution. 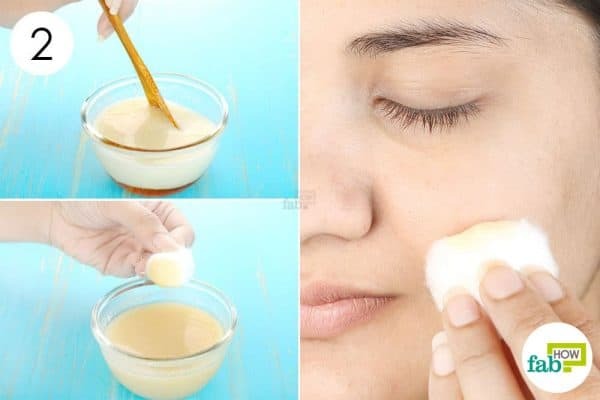 Use a cotton ball to apply the solution on the acne spots. Keep it on for 20 minutes, then rinse it off with lukewarm water. 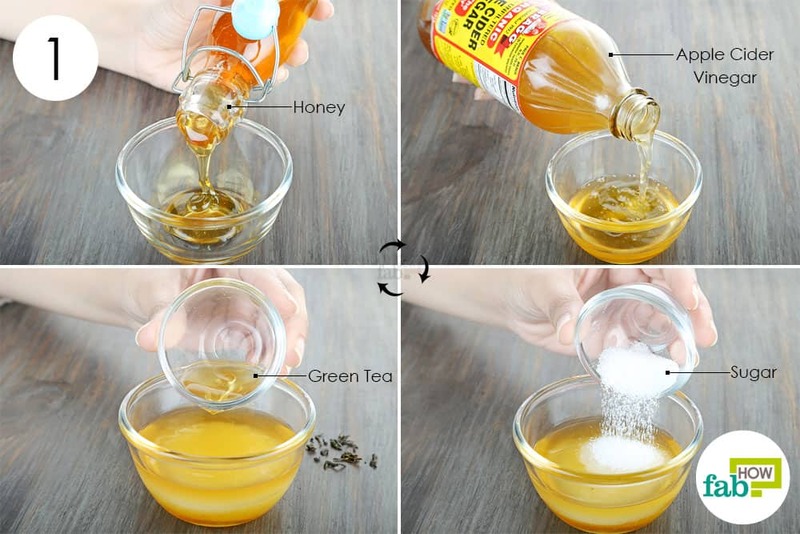 Follow this remedy daily for 2 to 3 weeks to use honey for acne. 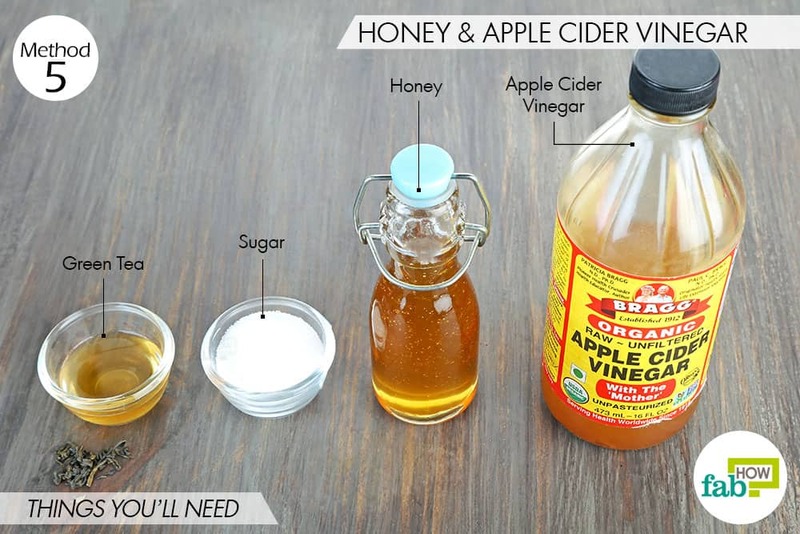 You may have heard the buzz about the benefits of apple cider vinegar. It is credited as a cure for a lot of things, including acne. 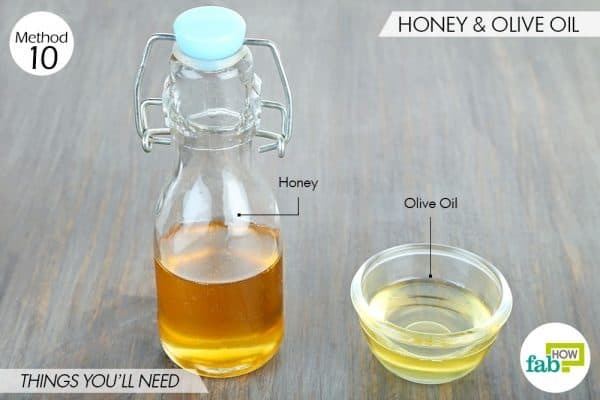 Using it with honey, sugar and green tea removes bacteria and excess oil from the pores, while also soothing your skin. The mild acidic property of apple cider vinegar balances your skin’s pH and controls the oil production. The green tea works as an astringent to shrink large pores that are particularly susceptible to acne. Plus, its anti-inflammatory properties reduce inflammation and redness when applied to the skin. Put 1 tablespoon of honey and ½ tablespoon of apple cider vinegar in a bowl. Add 2 tablespoons of sugar to it. Also, add 1 tablespoon of cooled green tea. Thoroughly blend all the ingredients. 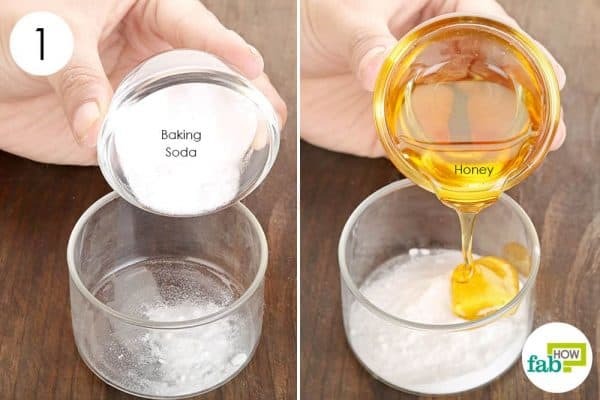 Apply the mixture on the acne-affected skin. Wash it off with cold water and pat dry your skin. 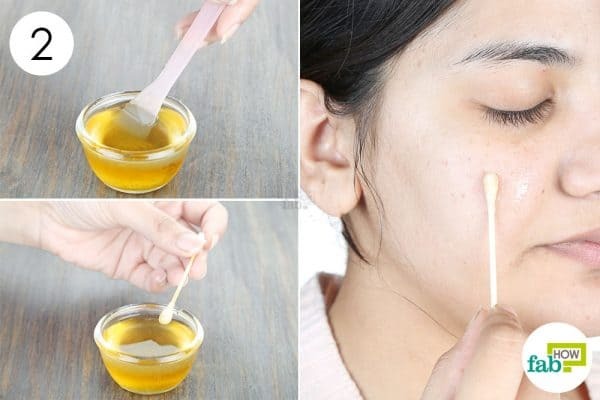 Use this remedy twice a week to get rid of acne. Aloe vera and honey used together can give you acne-free skin. Aloe vera gel contains glycoproteins that reduce inflammation, and since it has no oils, it doesn’t clog your pores. Honey’s antimicrobial property combats the acne-causing bacteria. 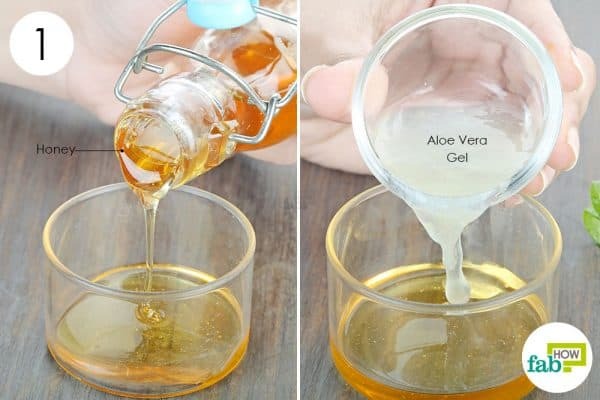 Add 1 tablespoon of aloe vera gel to it. Apply it on your acne using a cotton swab. Repeat daily for 2 weeks to treat acne breakout. 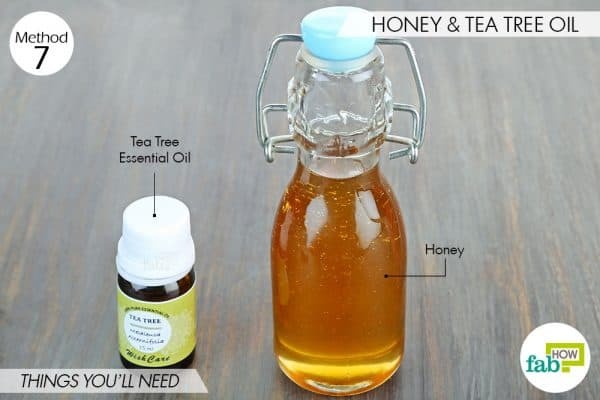 Acne can be annoying, but you can treat it with a simple mask made with honey and tea tree essential oil. Honey helps lock the moisture into your skin. Tea tree essential oil has powerful antimicrobial, antiseptic and antibacterial properties that fight the harmful bacteria in the pores. Plus, it removes dirt and impurities that contribute to breakouts and other infections. Caution: Since tea tree essential oil is a potent oil it can irritate your skin. Do a patch test first before applying the blend to your acne. Add 2 or 3 drops of tea tree oil to it. 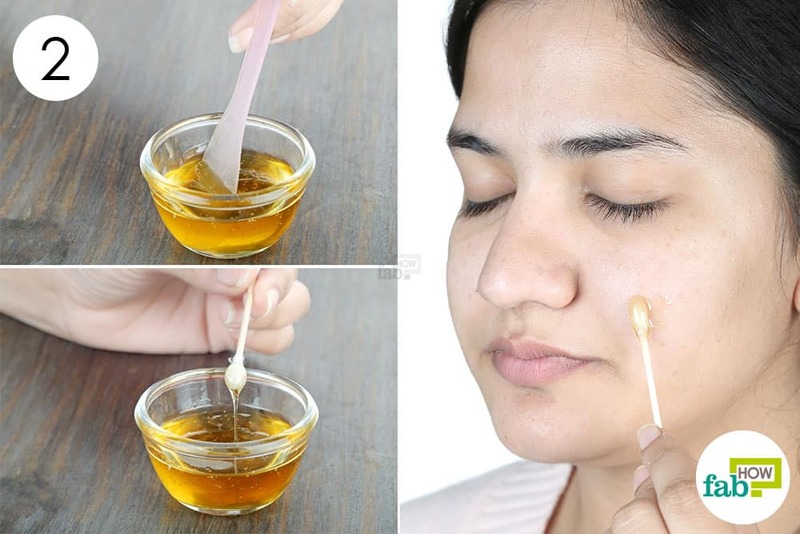 Use a cotton swab to apply this mixture as a spot treatment on the acne. Keep it on for 10 to 12 minutes. Use this remedy 2 or 3 times a week to get an acne-free skin. If you are suffering from acne breakouts, this mask can be your savior. Honey and coconut oil not only eliminate acne but also nourish your skin. Coconut oil contains vitamin E that keeps the skin healthy and vitamin K that has potassium that forms a protective layer on the skin. Plus, its antibacterial and antimicrobial properties destroy the acne-causing bacteria. Being a humectant, honey helps retain the optimum moisture in your skin. 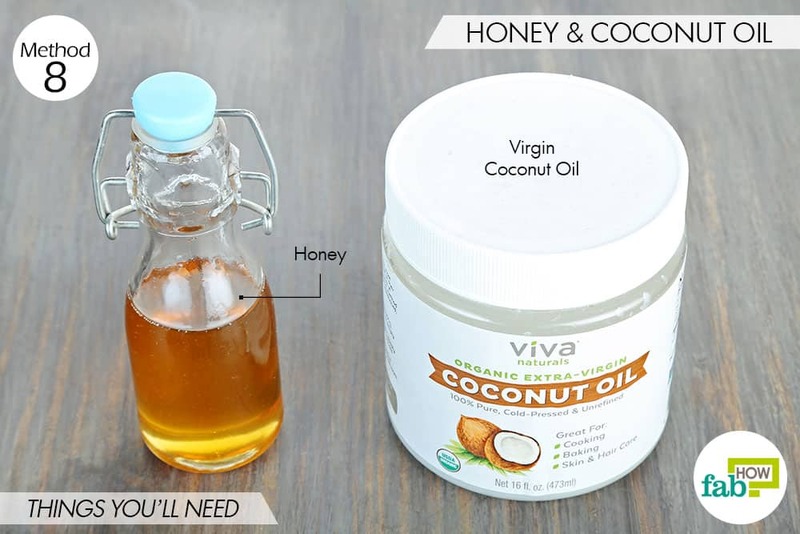 Add 1 tablespoon of coconut oil. Use a cotton swab to apply the blend as a spot treatment. 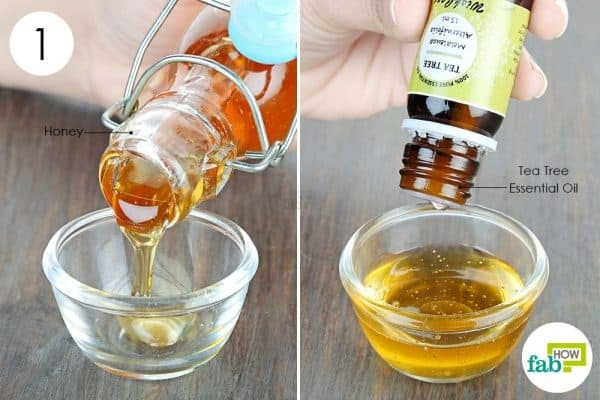 To use honey for acne, you can also apply it as a face mask. Repeat daily for 2 weeks to get rid of acne. Aspirin, which is commonly used to treat a fever or pain, can also treat acne breakouts. Aspirin helps remove blackheads and dries out the oil in the pores. 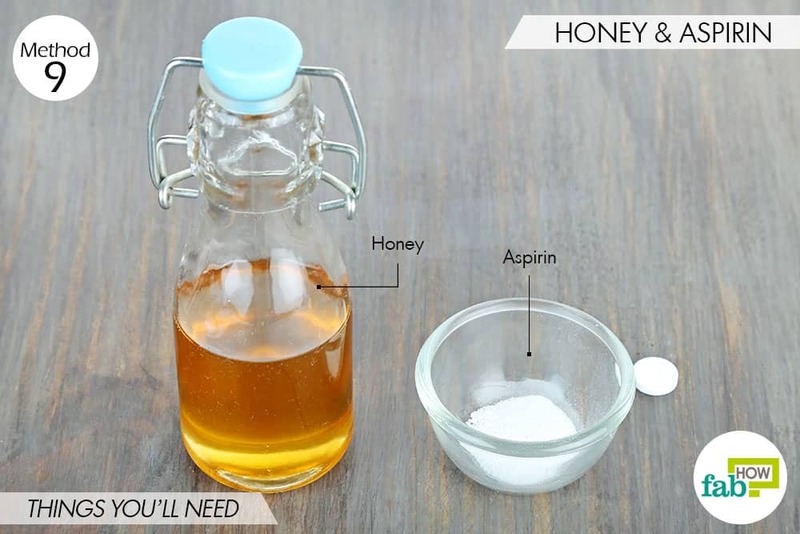 The salicylic acid in aspirin has drying properties, but using it with honey adds moisture to your skin. Plus, the antibacterial and anti-inflammatory properties of honey kill the bacteria and reduce inflammation. Note: Crush uncoated aspirin tablets to release the full effects of the salicylates and caffeine. Crush 3 uncoated aspirin tablets into powder form and put it in a bowl. 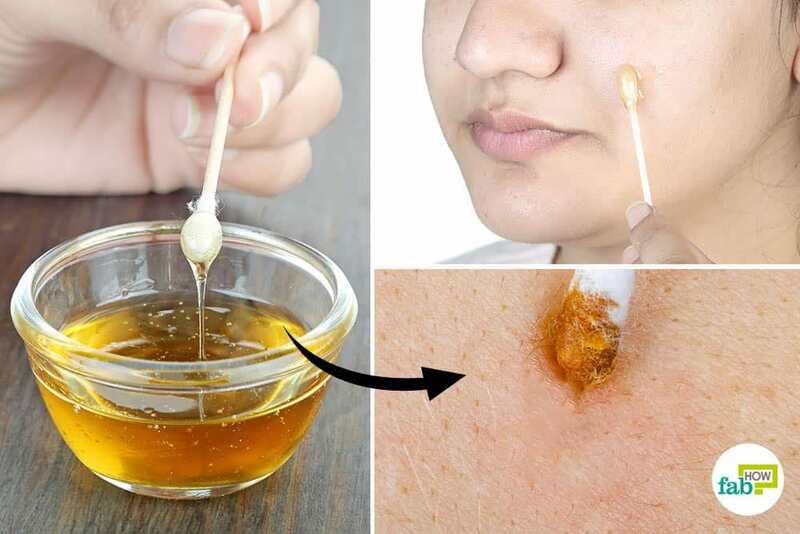 Use a cotton swab to apply this mixture on the acne spots. 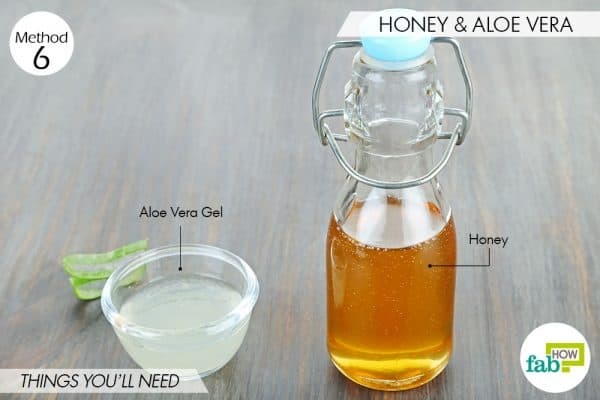 Use this remedy twice weekly for 2 weeks and get an acne-free skin. Olive oil contains vitamins that not only accelerate the healing of acne but also prevent acne scars from forming. Plus, the polyphenols, an antioxidant, present in olive oil detoxify by flushing chemicals from the skin. Moreover, its anti-inflammatory property reduces inflammation associated with acne. Using olive oil with honey for acne helps remove acne-causing bacteria, and the honey adds moisture to your skin. 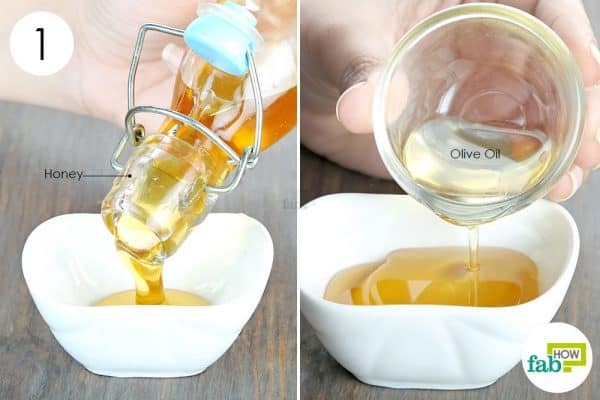 Put1 tablespoon of honey into a bowl. Blend them into a smooth mixture. Apply it as a spot treatment for acne. Keep it on for 10 to 15 minutes. Rinse your face with cold water, then gently pat dry your skin. Use this remedy twice weekly for 2 weeks to get rid of acne. 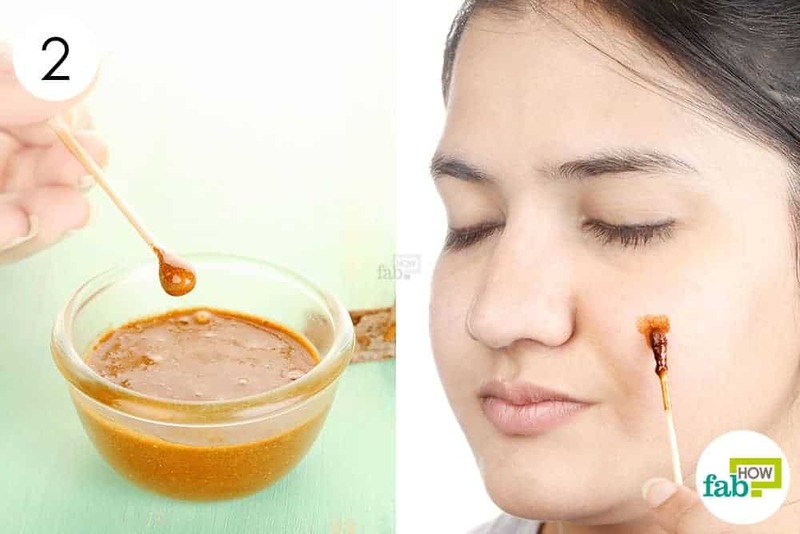 This remedy can also be used to remove scars. 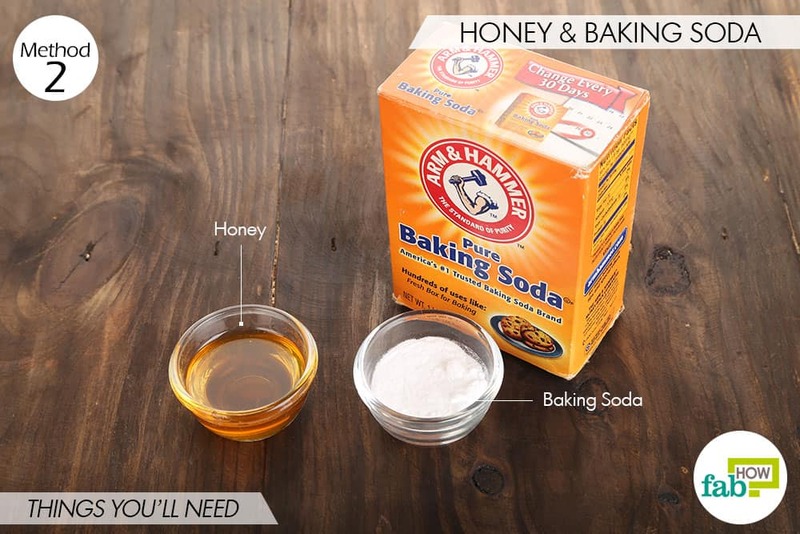 If you’re allergic to honey, you can use DIY baking soda masks for acne. 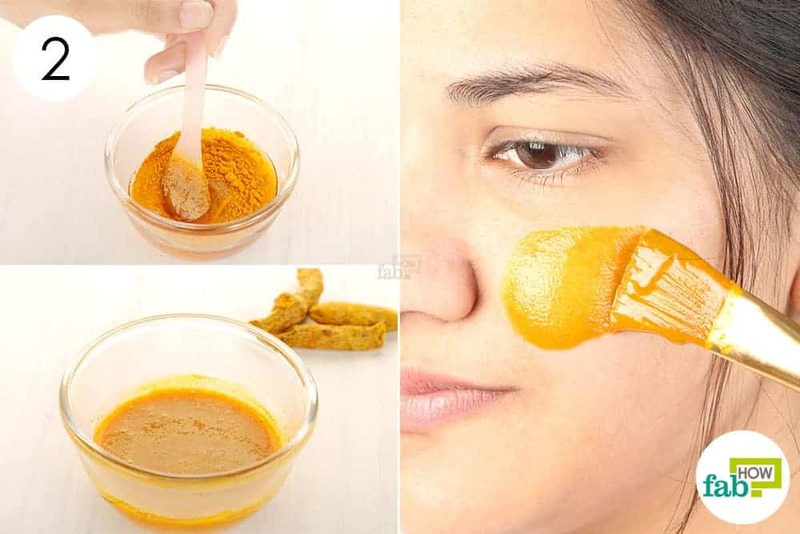 You can also try DIY turmeric masks for acne and pimples.